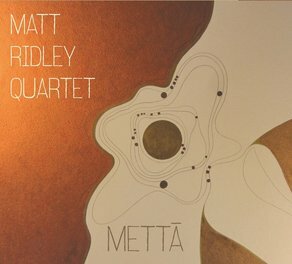 This is a fine new album from master bass man Matt Ridley heading his well chosen quartet and precedes a seven gig uk tour. Following on from "Thymos" (Whirlwind WR 4643) Jason Yarde has been given center stage in the new quartet playing only soprano, and this move has brought about a far more tighter and integrated feeling to the overall sound of the band. Compositions from both albums made up the set list for the groups performance at The South Bank Centre last November. A review of the gig and a background to the musicians can be found in our "Live Reviews" section. The album title "Metta" is a word taken from Buddhism meaning goodwill, friendship and kindness, the largely thoughtful, restrained calming performances on the disc well represent this ethos. All the tunes here are from one single studio session recorded last December. Things kick off with a fine piano introduction on "Music To Drive Home To" and as the soprano enters the feeling is of leafy country lanes rather than urban highways before the whole group integrates well to continue the relaxed ambiance. The soprano lays down the theme to "Lachrymose", a Latin word for tears or mournfulness before John Turville offers an exquisite piano solo over strong bass from the leader and fine brush work from George Hart. The tempo quickens and the improvisations are more complex on "Mental Cases" with a deep exploration of the theme from the soprano and driving percussion. "Strange Meeting" is an imaginative excursion for the whole quartet on a theme full of beauty and closes with a strong bass motif. The dancing sound of "Labyrinth" is augmented by eloquent bass before the piano takes over from the saxophone for a deeper exploration of the theme. Spikey and minimalist drumming bring the title track "Metta" into sharp focus and proceed two fine improvisations by Jason Yarde before the bass rises in the mix before the close. The final track "Ebb And Flow" does just that and showcases the piano alongside restrained soprano with strong bass and drums before the tempo rises to the climax. This highly absorbing and accessible recording is full of high quality improvising with strong original themes performed by one of our very best contemporary jazz quartets.